The first question elaborated in Part I is: How is it possible that we have programmable, interactive, multi-media, world wide communicating computers, that are not capable of communicating with their master. To answer this question, first applied cognitive psychology is analysed. This science should know how to design user-friendly computers. One approach applied cognitive psychology uses is an elementary approach focussing on isolated practical questions that easily can be answered using fundamental psychophysiological knowledge (What character size, what colour or what luminance to use?). This knowledge makes screens readable and buttons ‘press-able’. However, computers remain incomprehensible. Knowledge on how humans think is needed for comprehensible computers. Several students pointed out that a holistic approach is needed taking account of elementary knowledge together. Applied cognitive psychology does not straightforwardly state how the combination of elements of a design should be dealt with. The effects of size, colour and luminance is known. Not known, for instance, is which one of these three is the best to present a new entry in an alphabetical list. For cognitive problems, such as how to arrange trains on an indicator or options of a menu, applied cognitive psychology provides designers with little help. Many researchers flight for that problem in using scientific knowledge to answer questions dictated by practice and technology (“Where to position the OK button?” and “What is the best depth and breadth of a menu?”). 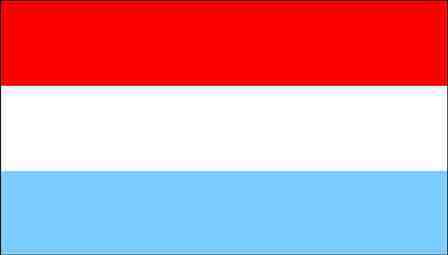 With scientific methodology they plant a scientific flag on a non-scientific, practical and technological load. Today the result of that approach is clear, computers still are userunfriendly and there is no general accepted foundation of applied cognitive psychology. This book elaborates and tests a Solution having the following characteristics. The questions to investigate do not follow from practice and technology but are dictated by science and psychology. Subject of study is not the interface technology itself, such as the menu or the touch screen, but the properties of that technology that are relevant to obtain insight in the way users think when performing a task with a computer. The load under the flag is not a practical or a technological problem but a synthesis of the relevant psychological knowledge needed to arrive at userfriendlyness. This psychological synthetic properties approach leads for practice to userfriendly designs and for science to fundamental knowledge needed to understand how users work with computers. In common language: not ‘more research is needed’ but ‘no further research is needed’, science has found the truth. The second question discussed in Part II is: What Solution will make computers user-friendly? The basis is the common Man Computer separation. ‘Man’ is specified in the Solution of this book as a system performing motor, perceptual, language, memory and thinking actions, for instance with a computer. Hands are typing or pointing, eyes focus on a screen reading icons or words that are associated in human memory and should help human thinking to perform a task. This specification seems obvious, however, in design practice, design literature and applied cognitive psychology it is not a common one. Usually the computer is specified as the interface technology applied. The focus is on interface technologies, such as menu’s, form filling, command language input and voice input. This book concludes that this interface technology approach cannot give insight in how humans think when working with computers. The book’s Solution is a properties approach. An interface is divided into properties having a direct link with the characteristics of psychological processes (movement, perception, language, learning and thinking). The properties of the elements of an interface can easily be defined using the elementary approach (e.g. size, form and contrast). Finding the properties for combinations of elements is more difficult. The book suggests three field properties: quantity, distance and structure. For all five function fields (movement, perception, language, memory, and thinking) the same three field properties apply. The third question in Part III is: Does the Solution deliver user-friendly computers? Four properties are used to find an experimental answer on that question (visual size, visual distance, cognitive quantity and cognitive structure). The tasks investigated are simple every day tasks like finding a station on a ticket vending machine, noticing that a vending machine is out of order and finding a train in a list of trains on a dynamic trains indicator. The first experiment, reported in chapter 8, is an easy one. The element property: visual size that is used to improve the userfriendlyness of finding a station in an alphabetical list. It is supposed that different properties for a new entry have a different effect on search time. European Railway companies used several lay outs such as an empty button with the letter ‘A’ above all stations starting with the letter ‘A’. The Solution provides a list of all basic lay outs. The Solution suggested using visual size to indicate a new letter in an alphabetic list. The answer on the third question proved to be that the Solution produces a more user-friendly list of stations than did the common design strategy. When visual distance is large, 6.4% of users does not notice the machine is out of order, and when visual distance is small 1.9% presses a button on the machine that is out of order. The text ‘how to insert a banknote’ is noticed by 69% of the users. When visual distance is reduced this figure is 78%. Both experiments give a positive answer on the third question. The Solution suggests a more user-friendly position the positions used in common designs. The conclusions on visual distance proved to be generalizable. When ticket vending machine technology changes from pressing a button with the name of the station, to entering a numerical code of the station, visual distance between station name and code is kept as low as possible. Station name and code are separated by one space only and not spaced by a tab, as usual. When ticket vending machine technology changes again, from a button interface to a touch screen interface, no new experiments are needed. The knowledge on visual distance was used to improve userfriendliness of the new touch screen train ticket vending machine and a coffee vending machine. Chapter 10 analyses cognitive quantity to improve the user friendliness of finding a departing train on a trains indicator. An observational experiment in Amsterdam Central Station revealed that only 62% is able to find the best train. Deleting less relevant trains makes 3% more passengers find the best train and reduces mean travel time wit 1.2 minutes. So the answer on the third question is: yes, the Solution leads to more userfriendliness than the common design. The conclusion proves to be generalizable to ticket vending machines where a better ticket type design is suggested, having less decisions to make per button press (on button ‘coffee with milk’ or two buttons, one for coffee and one for milk. The final experiment in chapter 11 focuses on using cognitive structure, again for the task of finding a departing train on a trains indicator. Another suggestion of the Solution is that cognitive structure of the information causes the poor performance of the passengers in the observational experiment. In an experiment the common trains indicator is compared with an uncommon destination indicator suggested by the Solution. The number of correct selections, the mean delay, the mean search time and the passenger evaluation are substantially better for the uncommon destinations indicator suggested by the Solution. Again a positive answer for the third question: the property approach delivers user-friendly trains indicators. The conclusion proves to be generalizable to other interface technologies (screen technology), to route strips presenting the stops of a train, time table books and computer program menu’s, which, as can be seen on any computer mostly are of a type the Solution identifies as ‘chaotic’. This book applies the Solution to the way travel information should be arranged enabling passengers to perform their tasks efficiently. The Solution easily is generalised to other interface domains such as screen vending machines, coffee vending machines, time table books and signposting and to other interface technologies such as computer screens. Theoretically, the Solution should be generalizable to the way information for designers should be arranged enabling them to design user-friendly machines. Both, passengers and designers, use the same psychological processes. The book accepts this challenge and tests the Solution, on the application of psychological knowledge for designers given by three solutions found in literature. The Solution suggests that these competing approaches arrange the information for designers in a chaotic way. Finally a last challenge for testing the Solution is, testing the Solution itself with the Solution. What is the opinion of the Solution on the Solution itself? What are the results of this book? Of course, userfriendliness is no issue. But there is more in this book. Designing a userfriendly machines seems to be the same as designing a cognitive psychological theory on designing. There is a solution that is capable of testing itself. Foresight of the Solution leads to uncommon design that, after being designed, with backsight are evaluated as the common ones. Not the usual 'more research is needed' but an unusual 'no more research is needed' is the conclusion. 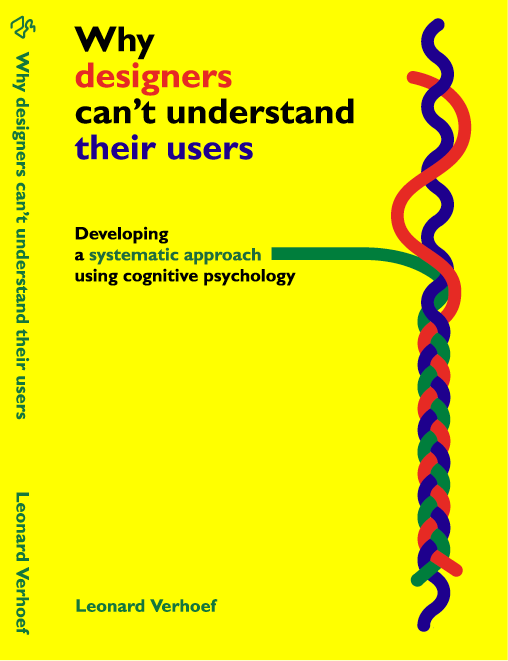 The Epilogue tries to come back to the title question of this book: “Why designers can’t understand their users”. So far the smoke screen of ‘science’ has been effective in not blaming psychology for one of today’s major commonly accepted mysteries: computers incapable of communicating with their master. This book foresees that when time has blown away the smoke screen of science, our grandchildren having backsight can’t understand why we accepted today’s mystery of userunfriendlyness and that they might blame today’s cognitive psychology. Cover and colophon. Click for more. Click for the summary in Dutch. Click for a full table of contents. From the beginnings of ergonomics, in the early years of the Twentieth Century, to this book in the early years of the Twenty First Century. How is it possible that we have programmable, interactive, multi-media, world wide communicating computers, that are not capable of communicating with their master. What Solution will make computers user-friendly? The basis is the common Man Computer separation. Four properties are used to find an experimental answer on that question (visual size, visual distance, cognitive quantity and cognitive structure). The tasks investigated are simple every day tasks like finding a station on a ticket vending machine, noticing that a vending machine is out of order and finding a train in a list of trains on a dynamic trains indicator. The first experiment, reported in chapter 8, is an easy one. The element property: visual size that is used to improve the userfriendlyness of finding a station in an alphabetical list. Chapter 9 analyses a visual field property, ’visual distance’ used to improve userfriendliness of two tasks: ’Notice a vending machine is out of order� and "Notice instructions on ’how to insert a banknote’." The final experiment in chapter 11 focuses on using cognitive structure, again for the task of finding a departing train on a trains indicator. Is applied cognitive psychology dead? One can blame echnology for the interface Problem as Norman (1990, 1998) does. One can blame management as Cooper does (1999). So far the smoke screen of science has been effective in not blaming psychology for the interface Problem. When time has blown away the smoke screen, I&apos;m afraid our grandchildren may well blame today&apos;s psychology for designers not understanding their users.